Sensory receptors for the general senses are widely distributed in the skin, muscles, tendons, ligaments, and visceral organs. Two types of thermoreceptors are located in the skin. Warm receptors are free nerve endings, which are sensory neuron dendrites, in the deep dermis that are most sensitive to temperatures above 25 °C (77°F). Cold receptors are free nerve endings in the superficial dermis that are most sensitive to temperatures below 20°C (68°F). Temperatures below 10°C (50°F) or above 45°C (113°F) stimulate pain receptors, which results in painful sensations. Thermoreceptors adapt very quickly to constant stimulation. Pressure, touch, and stretch receptors are mechanore- ceptors (mek-ah-no-re-cep’tors), which are sensitive to mechanical stimuli displacing the tissue in which they are located. Lamellated (Pacinian) corpuscles are rapidly adapting receptors used to detect deep pressure and stretch. They are located deep in the dermis, as well as in the ligaments and tendons associated with joints. 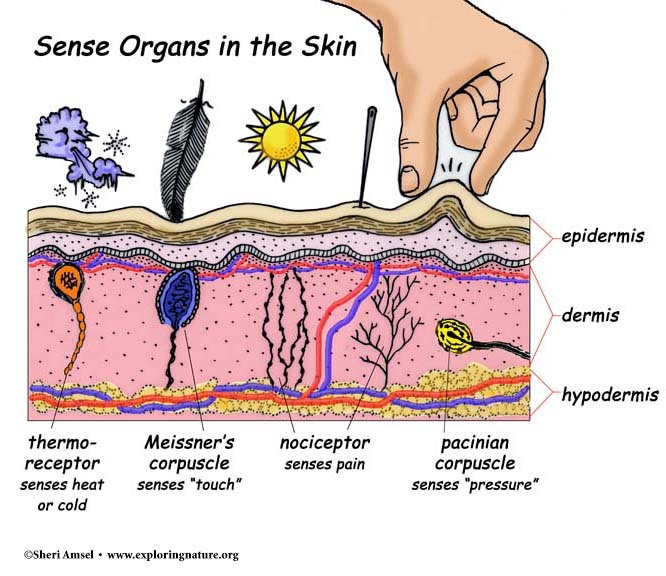 There are several types of receptors that function in the skin as touch receptors. Free nerve endings extend from the dermis superficially to the spaces between the epidermal cells. These endings function primarily as pain receptors but also serve to detect touch, itch, and temperature. The free nerve endings of the hair root plexus functions to detect hair displacement, such as when a bug lands on the forearm. Tactile (Meissner) corpuscles in the superficial dermis are most abundant in hairless areas such as fingertips, palms, and lips. These rapidly adapting receptors are useful in detecting the onset of light touch to the skin. Tactile discs in the superficial dermis are associated with tactile cells in the stratum basale of the epidermis in areas such as the fingertips, hands, lips, and external genitalia. Together these slowly adapting structures function in detecting light touch and pressure, such as when reading braille. Baroreceptors are free nerve endings that monitor stretching within distensible internal organs such as blood vessels, the stomach, and the bladder. Signals from these receptors are used to help regulate visceral reflexes such as those used to regulate blood pressure, digestion, and urination. For example, baroreceptors within the urinary bladder will trigger the urination reflex as the bladder fills and stretches. These receptors do not exhibit sensory adaptation owing to their role in regulating visceral reflexes. Proprioceptors, such as muscle spindles and tendon organs, are used to monitor changes in skeletal muscle stretching and tendon tension during skeletal muscle contraction and relaxation. These receptors keep us informed about the positioning of our body or body parts while stationary or moving. These receptors do not exhibit sensory adaptation owing to their role in maintaining posture, equilibrium, and muscle tone. The chemoreceptors that are part of the general senses are specialized neurons used to monitor body fluids for chemical changes. For example, chemoreceptors monitor changes in ion concentrations, pH, blood glucose levels, and dissolved gases. The signals created by these chemo- receptors are not processed within the cerebral cortex; this means that the sensation created within the brain cannot be consciously detected. easily adapt like many other sensory receptors. The lack of adaptation is a protective mechanism that allows the person to be aware of a harmful stimulus until it is removed. Projection by the cerebral cortex is not always accurate when the nerve impulses originate from nociceptors in visceral organs. When damage to visceral organs occurs, pain sensations are often projected or referred to an undamaged part of the body wall or limb. This type of pain is called referred pain. Referred pain is consistent from person to person and is important in the diagnosis of many disorders. For example, pain caused by a heart attack is referred to the left anterior chest wall, left shoulder, and left upper limb in both genders, while women also commonly experience pain in the abdomen and jaw and between the scapulae. Referred pain is due to communication between neurons within the same nerve that are carrying nerve impulses from both visceral organs and the body wall or a limb. For example, neurons carrying nerve impulses from the heart use the same nerves as those from the left shoulder and upper limb.